It’s not very often that I am gifted a sensational recipe from an exquisitely talented master chef. In this case, it’s a chef who is an inductee into the American Academy of Chef’s Culinary Hall of Fame, and the man who started the culinary programs at both The Art Institute of Phoenix and The Art Institute of Tucson. Now retired, Chef Bill Sy still guest teaches Asian Cuisine at the Art Institute of Phoenix, and if you want to learn the art of making a perfect pot sticker, he’s the man. Fortunately for all of us, Chef Sy believes in passing along ancient Chinese secrets. I was lucky enough to watch him in action years ago, and I’ll never forget the authentic flavor of the pot stickers and his simple technique for mastering those billowy pockets of goodness. So here is the recipe, from the chef who has won the respect and reverence of his peers, and who believes that cultivating talent and passing on traditions is his lifelong duty. Make him proud! Chop cabbage into small dices. In a large bowl, add ground pork (beef or chicken) and remainder of filling ingredients, mixing well. If mixture is dry, add a little chicken broth. In a bowl, mix flour and boiling water until a soft dough forms. On a lightly floured surface, knead dough about 5 minutes or until smooth. Divide the dough in half. Shape each half into a roll 12 inches long and cut each roll into ½" slices. Roll 1 slice of dough into a thin 3" circle and place 1 tbsp pork mixture in the center of the circle. Fold over to create a pouch. Lift up the edges of the circle and pinch 5-8 pleats up to create a pouch Repeat with the remaining slices of dough and filling. Heat a wok or nonstick skillet until very hot. Add 1 tbsp vegetable oil, tilting the wok to coat the sides. If using a nonstick skillet, add 1 tbsp vegetable oil. 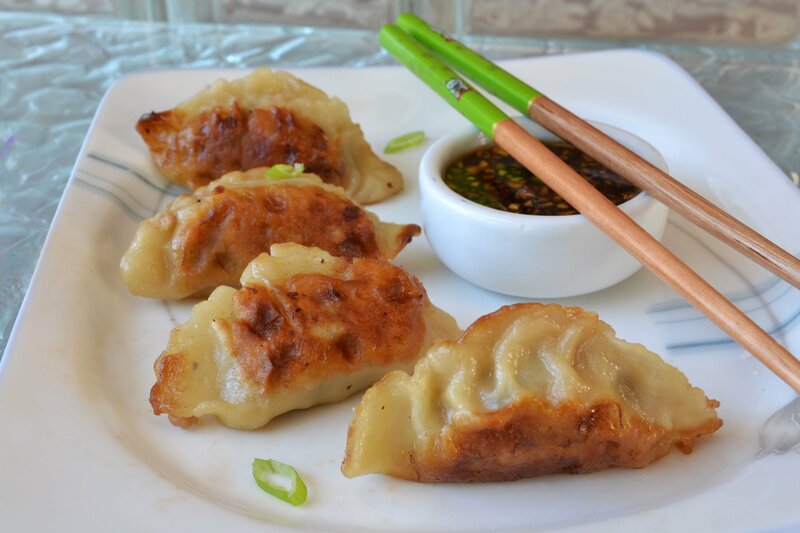 Place 12 dumplings in a single layer in pan and fry for 2 minutes, or until the bottoms are golden-brown. Add ½ cup water. Cover and on medium heat and cook 6-7 minutes, or until the water is absorbed. Repeat with the remaining dumplings. Mix together all the ingredients for the dipping sauce and enjoy!